This mod's "Bigger on the Inside" feature is incompatible with most performance booster mods such as Optifine, BetterFPS, CodeChicken. We cannot change that. Create an issue on the mod's Github Issue tracker! This is the fastest method as it is easily seen and managed by the developers. Q: Is this mod a continuation of the original Tardis Mod by ShaneDarkholme? A: No, while the New Tardis Mod was inspired by the original mod, it has no relation to it. Q: Who made this mod? 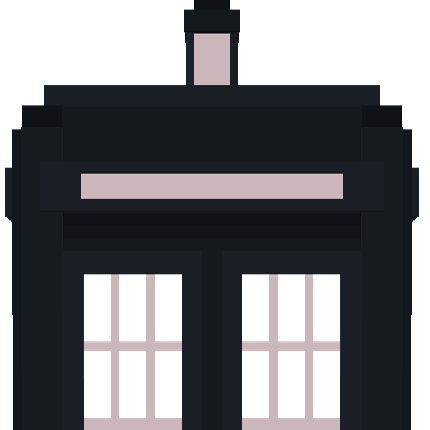 A: The New Tardis Mod was founded by Spectre0987, but is developed by a group of people. The developers are the Tardis Team: http://tardis-mod.com/books/home/page/meet-the-team . Q: I was told by X that Y was added/implemented this way. Why does it not work this way?!?! A: Your installed version of the mod may not match with the version the information is referring to, or the information may be inaccurate. Q: Are core mods required? A: No. You only need the Tardis mod jar file. Q: Which version of Forge do I need? A: The recommended version is the latest version of Forge for Minecraft 1.12.2. The final decision is up to you, however. Q: Will you add support for cracked versions? A: No, the developers do not support cracked Minecraft versions. Q: How do I fly the TARDIS? Q: Why is the Tardis not taking off/What are Sub-systems? Q: How do I summon my TARDIS? A: You will need to bind a remote to the console unit first. You do this by right-clicking the console unit with one and then right-clicking a block. The Tardis will land roughly near the block’s coordinates. Q: How do I obtain mercury bottles? A: Put Cinnabar dust in the Alembic, then right-click the alembic with a glass bottle. Q: How do I generate rooms? A: You cannot as of 0.0.6+. You must make one. Q: Can I have more than one Tardis per world save? You can find more information on the mod's wiki. Like my mods? Consider donating! What do the stabilizers do? They make it where you don't have to do the mini- game to fly the TARDIS. During the mini-game, I get the alerts but I don't know what to do. I've looked for the instructions for the mini-game on the wiki, are they there and I'm too stupid to find them? Because that's the best part of a tardis mod for me: Hittin them buttons when flying!!! Using the manual, find the x, y, z coordinates on the console. And sure thing! When will you release the next update (and opening doors with snap)? Hi, I heard there isn't a set date for the next release, the developers generally release new builds whenever they are ready. The finger snap feature has been removed from the Tardis mod and moved to the Handles mod. If you install both Tardis and Handles mods, you can use this feature. Not sure if this is a bug, or a reference to "Space and Time" (The Red Nose Day Special Episode), but using the Random Co-ordinate Generator, followed by the Time Rotor Handbrake, I've managed to land inside my own TARDIS. When I try to relocate, I can't even Dematerialise, let alone go anywhere. I've done this 5 times. I had to use "/tardis remove" the first time I did it... I've also attempted to restart systems, such as the flight system and Dimensional Dams System, but nothing is helping. It may be due to me trying to change Dimension, as whenever I try to, this seems to happen. Is this a bug or a feature, and either way, any idea on how to relocate to somewhere that isn't my own TARDIS? You need to replace the thermo- couplings, but right click the monitor and click subsystems to see what's missing. 2. Just a small suggestion.. I rewatched 'twice upon a time' recently and noticed that the roundel doors of the Tardis were the actual exterior doors just from the inside so.. it would be great if those were sorta reskins of the interior doors. On your second point, this was not always the case. During Hartnell's era alone (which I'll count Twice Upon A Time as part of for sake of it's technically meant to be the same interior), the roundel doors were both the same as the police box doors, and seperate. In some episodes, you could even see the police box doors beyond the roundels, similar to the modern era. Then sometimes it was just a void between the box and roundels, similar to the other eras of the Classic series, and then sometimes it functioned like it did in Twice Upon A Time. will all the versions of the Daleks and Cybermen be added to the mod?, perhaps the K.9 versions too? What version of forge would I use to run this mod? Please help. You have to re-log when you change the interior, it's a known issue.